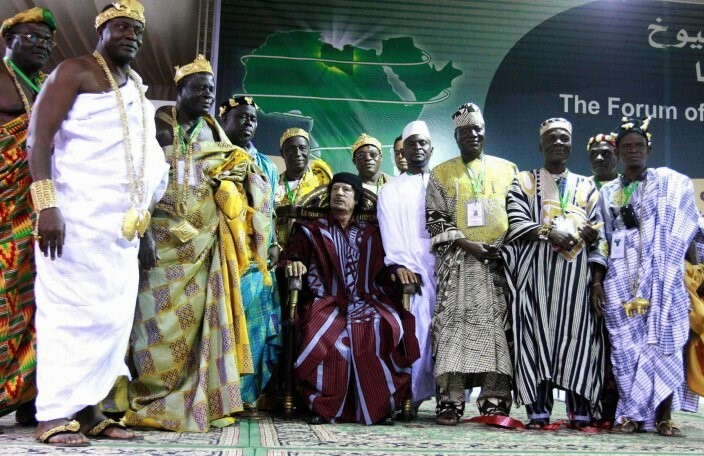 Libyan leader Muammar el-Qaddafi poses for the camera during a meeting with kings, princes, sultans and the sheikhs of various tribes of Africa in Benghazi on August 28, 2008. Libyan dictator Muammar el-Qaddaﬁ, killed by rebels in 2011, left behind a legacy of chaos, brutality and trauma. But he also left a surprisingly modern political vision—of a Pan-African state. In 1999, Qaddaﬁ began to push for the creation of an African Union (AU), modelled loosely on its European counterpart, the EU. Eight years later, the AU—the 54-member continental body launched in 2002—is taking steps toward Qaddaﬁ’s improbable dream. This month, business leaders and economists will press the case for uniting Africa’s economies at the World Economic Forum, which runs from May 11 to 13 in the Rwandan capital, Kigali. The proponents of an EU-style AU know another key fact about the EU—European unity has brought immense prosperity and peace to what was for centuries a frequently war-torn continent. Many African politicians and business leaders like what they see when they look north. The EU is home to 7.3 per cent of the world’s population but generates 24 per cent of the world’s gross domestic product. It is a Western superpower that has exerted global influence through diplomacy and liberal, humanitarian values. And Europe’s open internal borders have played a major role in those accomplishments. There’s a growing sense among many proponents of greater unity between African nations that now is the time to push for a deal to form a similar bloc. In its Agenda 2063—a platform announced in 2013 outlining policies necessary to transform the continent over the following 50 years—the AU proposed establishing a Continental Free Trade Area by 2017, abolishing visa requirements for African citizens in African countries by 2018 and eventually introducing an African passport. With sub-Saharan economies, such as those of Rwanda and Ethiopia, booming—the International Monetary Fund estimates the region will grow by 4.3 per cent in 2016—continental bodies like the AU and the African Development Bank are increasingly pushing for open borders as a way to boost prosperity across the whole continent. Africa already has eight Regional Economic Communities that have increased cross-border trade among members. But while the move toward realizing the vision of a borderless Africa comes at a time of growth and opportunity in some countries, the continent has also been grappling with some of the same challenges straining the European project: a rise in Islamist terrorism and a surge in refugees. Public health crises, such as the 2014 outbreak of the Ebola virus, have also raised fears that passport-free travel will exacerbate the spread of disease. In spite of those challenges, growing numbers of entrepreneurs—African and non-African—are starting new businesses on the continent. In 2012, after taking a vacation in Rwanda, Californian businessman Trevor Green founded a construction company named Remote Group in the Rwandan capital, Kigali, with operations in East and Central Africa. Green believes Rwanda is an example of how an integrated Africa could prosper. The tiny, landlocked country has a comparatively relaxed policy on visas, which are issued upon arrival to Africans. Green, whose company is involved in building affordable housing in Cameroon and laying roads in the Democratic Republic of Congo’s war-torn North Kivu region, says he often runs into difficulty trying to coordinate and move his workforce across the continent. Two decades after the 1994 genocide that claimed the lives of some 800,000 people, Rwanda has made significant economic progress, averaging real GDP growth of about 8 percent every year between 2001 and 2015. It is ranked as the second-easiest place to do business in Africa, just behind Mauritius. “Here’s a country that has, in theory, every disadvantage possible,” says J. Peter Pham, director of the Africa Center at the Atlantic Council. “But it has attracted a lot of investment and is a regional hub within an otherwise somewhat unreliable neighbourhood.” In addition to its visa-upon-arrival policy, since January 2014 Kenyans and Ugandans have been able to travel through Rwanda by simply showing a national identity card (and tourists can buy a single three-country visa) rather than a passport, a measure that has increased cross-border trade by 50 percent between these three countries. Continent wide, however, Africans still aren’t doing business with each other. A 2015 U.N. report found intra-African trade constituted just 14 per cent of the continent’s total trade, compared with 61 per cent of intraregional trade in the EU. In December, Anabel Gonzalez, senior director of the World Bank Group Global Practice on Trade and Competitiveness, said that intra-African trade costs are the highest of any developing region, about 50 per cent higher than in East Asia. She noted that supermarket delivery trucks crossing southern Africa sometimes need up to 1,600 permits and licenses just to cross borders, and they can end up spending tens of thousands of dollars on them. Some analysts say Africa has a long way to go before free movement or an African passport could be introduced. “Many African countries still don’t have anything close to an identity card,” says the Atlantic Council’s Pham.